The Beatles couldn’t have said it any better. After a week that’s seen three client websites go live, a video shoot here at the barn, the beginning stages of a product launch, design work on two additional client websites, and a few upgrades to our own site to boot… well, we feel like we’ve been working like a dog eight days a week. Digital marketing in New Jersey (or anywhere, to be fair) is hard work, but the results have been gratifying, particularly these website launches. The actual launching of a new web design isn’t terribly complex – you test, fix, test again, backup the original, change the DNS to point to the new one, test some more and then drink some champagne. But it’s really the hard work and planning that precede launch day that make a website what it is. The three sites that we set free this week benefitted from plenty of both, as well as great collaborations with our clients. The first site to launch this week was Opengear – the network and data center hardware manufacturer with major street cred amongst tech geeks around the world. 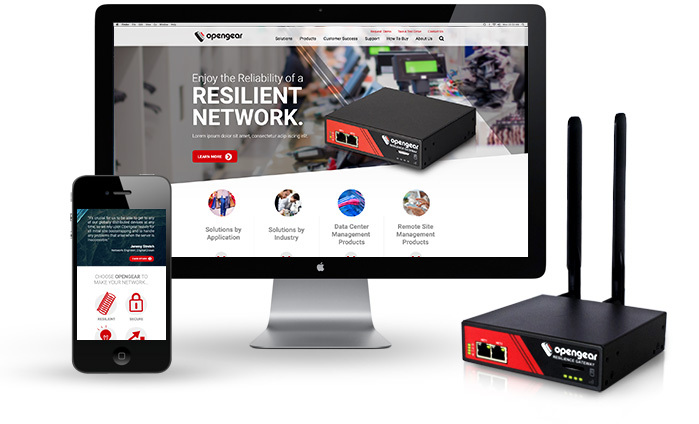 Like their products, the new Opengear website is highly functional and feature rich. The site dynamically serves 881 unique product variations for sale to customers across North America, EMEA and APAC. Lead-gen forms are tied into Salesforce and the Act-On marketing automation platform. Aesthetically, the web design and marketing it supports are quite unique to Opengear, as are the headlines and supporting copy we crafted. The design team here at Ridge, led by art director Rose Arenas, created a light and high-tech feel by featuring plenty of whitespace, light gray accents and large, gothic type that’s punctuated by pops of red. The sharp angles featured on the main images and overlapping product photos were designed to match the labeling on Opengear’s products and were accomplished programmatically through CSS by web development lead Greg Dubois. 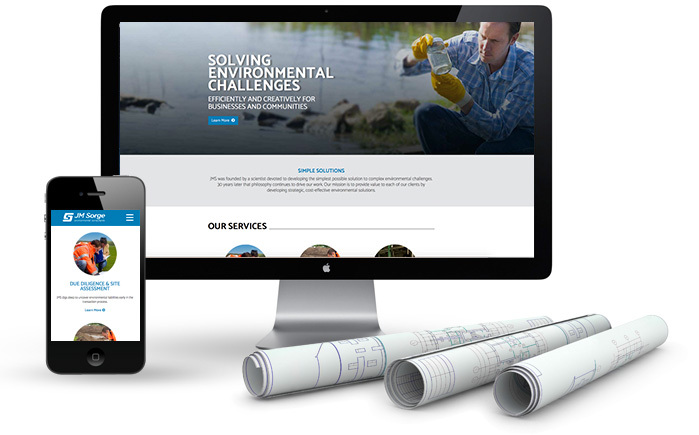 Site number two was a makeover of a site we first designed way back in 2011 (remember, web years are like dog years) for local environmental consulting firm JM Sorge. The site, designed by web design aficionado Eugene Shutov and coded by designer/developer Freda Moore, features immersive imagery and color in a scrolling, parallax design. The site is optimized to fit the desktops, laptops and phones of busy real estate developers, attorneys and municipality leaders who are often on the go or at the job site. 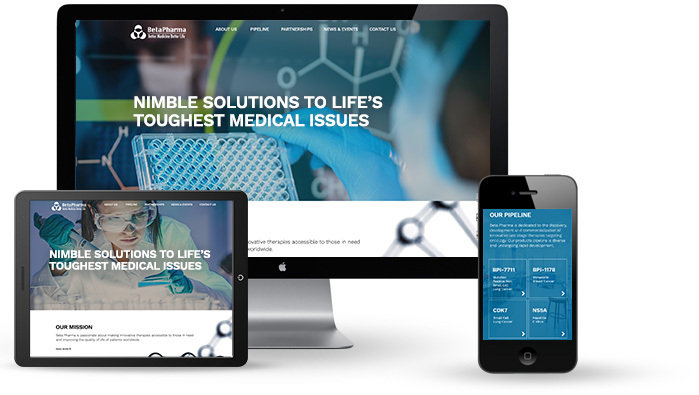 The third and final site of the week was for emerging specialty pharmaceutical company Beta Pharma. Beta looked to the Ridge team, again led by Eugene and Freda, to create a feeling of innovation and sophistication befitting an organization that’s actively developing several late stage oncology and virology therapies. The site features a bold color scheme and elegant, clean design, with homepage imagery set on a random to give the site a unique feel for every visit. The gang is already back to workin’ like a dog on our next New Jersey digital marketing adventures… but if you’d like to hear what we’d do to refresh your company’s website, please get in touch with us.